This utensil is one of my favourites in the kitchen, and any kitchen should be equipped with a "Y" shaped vegetable peeler. Not only are they great on vegetables but they work well with a variety of other foods. I use mine all the time - and I am sure you will find good uses too. They are great for peeling apples or hard fruits like that. But I especially love them to make "shavings" or "curls" of either chocolate or cheese. 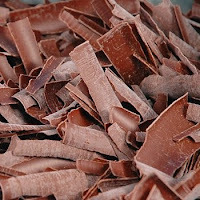 The chocolate shavings are great to put on top of desserts to fancy them up, they are decorative and pretty! For cheese shavings, I often use the peeler for parmesan cheese when I am adding it into a salad and want it to look extra nice, or when I just want thin shavings in my salad. 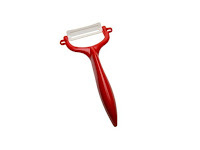 It is also great for cutting slabs of any type of brick cheese! Try one out of new things and I guarantee you it will become one of your new favourite tools!